There are many interesting facts and information about the penguins which make us eager to know more about their suspicious life. The way these birds live, eat, swim, hunt and sleep is entirely different from the other birds which makes them different too. 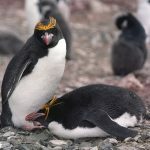 Some people generally asked that where do penguins sleep? Do they sleep on the water or the surface or is there any particular place where they take a nap? Till now we talk about lots of different breeds of penguins. Now it’s time to talk about the rockhopper penguins and where do rockhopper penguins live? A rockhopper penguin is a group of penguins that share the similar enjoyment of jumping on the rocks instead of sliding around on the bellies which a normal penguin do. Mainly 3 diverse species of rockhopper penguin comprises of the eastern rockhopper penguin, western rockhopper penguin, as well as the northern rockhopper penguin.